Under growing pressure from nervous financial markets, the leaders of France and Germany reached a compromise agreement Monday to seek mandatory limits on budget deficits among debt-laden European governments. The limits–a “golden rule” of 3 percent of Gross Domestic Product–would be enforced by leaders of the European Community, according to explanations provided by President Nicolas Sarkozy of France and German Chancellor Angela Merkel at a joint news conference here. I have mixed feelings about this. On the one hand, a more reliable backstop mechanism is important to stop runs on weak countries (and their banks), and it’s hardly reasonable for the eurozone’s core countries to agree to fund this without some say over the budgets of the countries they’re guaranteeing. As it happens, this deal doesn’t actually appear to be an awful lot more binding than the current rules, but still, it’s probably a good first step if this is what it takes to get nervous Germans on board. 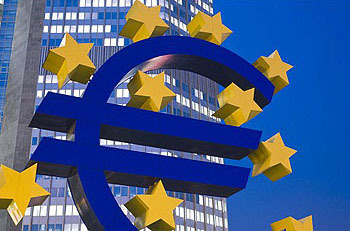 On the other hand, budget deficits have never been at the core of the eurozone’s problems. Capital flows have. This deal doesn’t appear to do much about that, so it’s not clear to me that it’s really a long-term solution. Still, a medium-term solution will do the job for now, and perhaps the longer term will find its own solutions in the future. This is at least moderately promising progress, assuming that the necessary treaty changes can be approved in a fairly short time. It’s the first time in a while that I’ve felt anything but gloom over Europe.